Nintendo’s quietly building hype with its Wii U, selling out pre-orders at every retailer around, from its own Nintendo World Store to GameStop. Microsoft is letting the Xbox 360 speak for itself this fall, with a rock solid library, reliable releases like Halo 4 and Xbox Live community staples like Call of Duty: Black Ops 2 to carry the device through what’s likely its last full price season. Then there’s Sony. It’s not entirely clear what Sony is doing with its PlayStation business, other than giving the brand a quiet makeover. The latest facelift to hit PlayStation: Sony announced the details of a full makeover for the PlayStation Store on PlayStation 3. Long overdue, Sony finally made public its much-rumored plans to refresh its digital game storefront on Thursday. The redesigned store will go live next Wednesday, and bring with it what Sony hopes will be a markedly smoother shopping experience, opening up what’s become a substantial catalog of retro and modern downloadable games. What’s changed? Everything. The baby blue theme that has become the trademark of the PSN, key in its little shopping bag logo, has been replaced with a sleeker black and grey theme that recalls Sony’s industrial design (televisions, consoles casings, etc.) 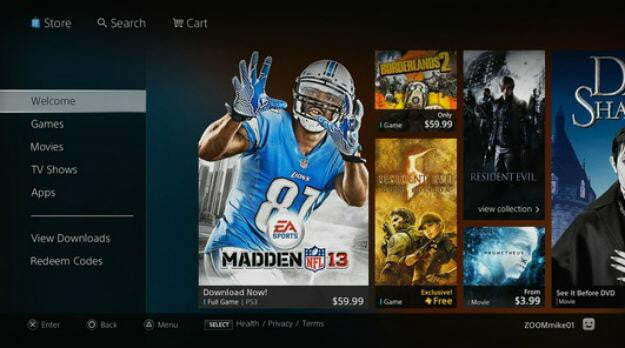 The store itself is laid out quite similarly to the current Xbox Live dashboard, with large windows advertising new releases in categories like Movies and Games. The cosmetic shift bellies the more user friendly changes though, as categories for products expand not unlike the Cross Media Bar (XMB) used for navigating the PS3 itself. Selecting PlayStation 3 Games will bring out a slider menu that lets you explore options by price, release date, and other sub-categories that should help people better discover things as well as find things they’re looking for. Even search tools have been overhauled. A solid makeover to keep the platform relevant and people spending on the product. It’s the same ethos behind the facelift given to the PlayStation 3 itself, a new model that’s lighter, smaller, and cheaper to make. The only problem is that, while Sony is doing the leg work to make PlayStation more approachable and appealing as a service and as a machine, it’s not offering the full package of new exclusive content and a lower price to go with it. The new store may seem like a small change, but it could be significant for Sony were it brining in a huge number of new users this fall with a cheaper machine. It isn’t though.